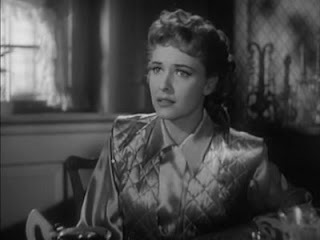 The 1946 film noir “The Locket” hasn’t been released on disc anywhere outside of Spain, causing it to slip ever further into the status of footnote, unvaryingly and almost exclusively during discussions of flashbacks. That’s not without reason, as “The Locket” features an outwardly intimidating triple-layer flashback structure, but the film has much more to offer including a very Hitchcockian treatment of tension, suspicion and psychology. 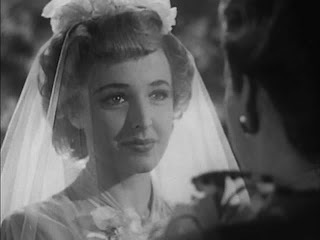 The film begins with John Willis about to marry Nancy (Laraine Day), a mysterious but charming woman that the Willis’s extended family knows next to nothing about. 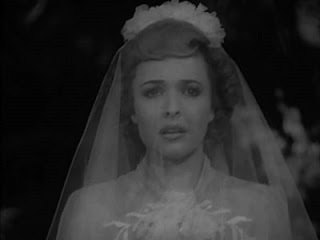 The prenuptial party is crashed by psychiatrist Harry Blair (who has the poor taste to reduce the wedding to mere framing device) who claims that Nancy is his ex-wife and a deeply unstable murderess. Dr. Blair relates how he was visited in his office by a Norman Clyde (Robert Mitchum), an uncompromising artist who was once very much in love with Nancy until he began to suspect she was a compulsive kleptomaniac who once killed to cover up a theft. He traces her disorder to a childhood incident she once confessed (via flashback once again) in which she was falsely accused of stealing a locket from a rich girl. The story, even as vague as I’ve outlined, may seem needlessly complex. After all, the plot could have been told in chronological order from Nancy’s point of view growing up and dealing with her troubles or from the perspective of an investigator hired by Willis’s family to determine the background of John’s fiancée. By nesting flashbacks inside each other, however, the film effectively reverses chronology. The journey deeper into Nancy’s past becomes a probe into her mind, peeling away layers on a quest for the truth behind her pleasant and unassuming exterior. The flashbacks also cause the earliest scene to be literally the centerpiece of the film; elevating it to the importance it is due with respect to cinema’s infatuation with Freudian psychology. The title also lends weight to this crucial childhood incident. Thankfully, director John Brahm does a fine job of the scene, taking what may seem a minor incident and using it as the kernel from which much strife will germinate. While the child actors are about what you’d expect in terms of talent, Brahm builds just the right tone out of the condescension of adults, the emotional fragility of children and the overwhelming trauma when young innocence first confronts bald injustice. Of course, the movie wouldn’t be any fun if simply recalling the original trigger event cured the present repercussions, the all-too-common anticlimax of several similar films (gialli, I’m looking at you). “The Locket” instead ramps up the tension, by showing how knowledge of Nancy’s kleptomania only causes her successive lovers to be beleaguered with doubt. As we gradually backtrack out of the nested flashbacks, each man loses Nancy, finds their clueless successor and infects him with a tale that is treated with initial skepticism, but spreads like a viral paranoia. This is where the Hitchcock feel really kicks in. 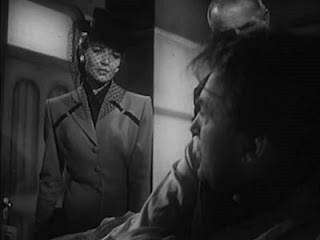 John Brahm, whose frequently overlooked noir credentials include “The Lodger” (1944) and “Hangover Square” (1945), constructs plenty of delightful scenes in which the hapless menfolk remain just out of reach of confirming their suspicions about Nancy, but fail until some perversely unexpected moment. Meanwhile, Nancy, who compulsively and often convincing lies to cover her tracks, has the infuriating tendency to believe herself. She’s like an inadvertent femme fatale who isn’t even aware of her own crimes or bizarre agenda. It’s a fun plot with little excesses that fans of film noir will appreciate (amongst them, one of my favorite filmic suicides in recent memory), but far too much contrivance to please the straight drama crowd. The screenplay is quite talky, especially with all the layers of flashbacking narrators, and although it doesn’t rely on crackling wit, the dialogue relishes in the clashes between characters. It brings out the theme of disparity between certainty and truth that is seen in Nancy’s self-serving delusions, the men’s defense of her honor and the fatal accusation that set it all in motion. 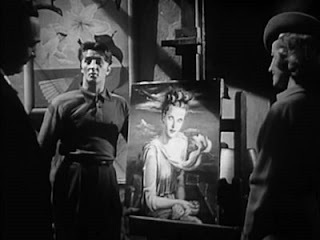 "The Locket" is the type of screenplay that somehow has Robert Mitchum as a sensitive painter discussing his artistic integrity, where it’s inevitable that the cocky psychiatrist will be driven crazy and that doesn’t mind telling you point blank that the locket is just a symbol for the unconditional love Nancy needs (the source novel is even called “What Nancy Wanted”). Oh, and for a film noir, it’s odd that we never actually see a gun. Is it great writing? Maybe not. But it’s awfully good storytelling. just wanted to let you know that i really like yr blog. .. . ... all the way from denmark. especially the fact that you have reviews of jodorowsky, zulawski, herz (i too love the cremator)etc. btw, i found "sweet movie" to be quite funny. We have very similar taste! I too enjoyed Sweet Movie, although "funny" doesn't quite do justice to the range of reactions it elicits. I have to admit I was a bit squeamish on more than one occasion throughout, but other times I was laughing out loud or gawking in amazement. I've been looking forward to Makavejev's "WR: Mysteries of the Organism" since then, but haven't yet plunked down the cash for the DVD. If you've seen that one, let me know if you consider it to be as good. Is the film culture over in Denmark pretty strong? I seem to have a disproportionately high number of Scandinavian readers. Maybe you guys just have better taste than in the states. I heard on the radio yesterday that in international polls, Scandinavian countries have about the highest overall life satisfaction. I got to get over there some time. Speaking of Europe, I'll be in London and then Belfast May 11th through 19th. If any Film Walrus readers will be in the right place at the right time, let me know! I remember reading about this movie when I was doing my film noir thesis, but I never got a chance to see it. Speaking of flashbacks and Hitchcock - what's your feeling on Stage Fright? I honestly hardly remember the plot, but I remember liking it a lot more than was considered proper for its place amongst Hitchcock's oeuvre. I remember reading somewhere that Hitchcock thought that the false flashback at the beginning was a big mistake, but it was possibly my favorite part of the film - the fact that it was a lie, that is, and that the other characters base their actions upon it. i actually prefer Sweet Movie over WR even though i think it's the general conception that WR is the better film (but who cares about that anyway?). yesterday someone told me to see Innocence Unprotected, so i'm really looking forward to that one. and i actually think you might be right about Sweet Movie. Sometimes funny, sometimes wonderful eccentric and sometimes plain annoying. i think that was one of the things i liked - if that makes any sense. I don't really know if the film culture is stronger in scandinavia. i don't have any idea of what it's like in the states. Denmark, i think, is good. Copenhagen especially. Independent cinemas, film clubs and stuff like that. All in all, i consider copenhagen a good city film-wise. 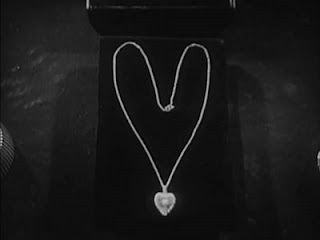 I stumbled upon your blog whilst searching for images for my own review of the Locket...! I just read and greatly enjoyed your review. Especially the screen captures..! Where did you get them? Did you have the DVD version? I just had a VHS of an AMC airing I taped. Btw, I LOVE Sweet Movie, and I also enjoy WR: Mysteries of the Organism, so I'll be checking in on your blog often and adding it to my blogroll. - The Mysterious Ad)ri.an B(e;ta[m.a.x. Glad you enjoyed the reviews. Sadly, I had to pull the screenshots from a (rather decent) torrent sourced from god knows where (probably the Spanish DVD). The version I originally saw was on a VHS that was both incomplete and washed out. I read your review and it sounded like you didn't care for the film very much. I'm not sure I'd canonize Brahm myself, but I actually find him really enjoyable. I like the combination of noir with a somewhat over-the-top flair, even if it isn't in conventional good taste. I actually did enjoy the film quite a bit, especially for certain stretches, like the third level of flashback with the little girls and some of the Mitchum scenes, but in my reviews I like to be hyper-critical. 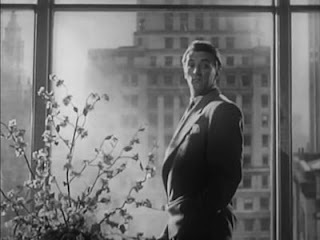 My high point was Mitchum's line: "You're no psychiatrist. You don't know truth from lies. You're just a lovesick quack!" It is perhaps a phantom canonization I'm reacting to, but I could swear I heard some people leaning that way with Brahm. But I still like to push for the best from all directors (even dead ones!). what no one has quite said yet about this marvelous, clever, re-watchable film is that its title, and its central emblem, points to its technique: the enclosed case of "the locket," surely, is the series of nested flashbacks, as well as the "love" the Aherne character names as what it's a "symbol" of. 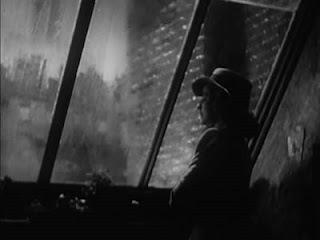 In that sense, the title of the film indirectly labels the film's most radical technical achievement, as does the title of Hitchcock's "Rope," with its (cheated) continuous 'one-shot' artistry. For those of us who love flashbacks, especially in noir, "The Locket" is the perfect title.